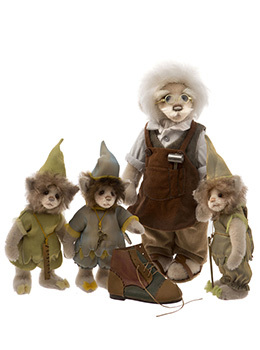 Charlie Bears Elves and Shoemaker Discounts Apply ! The Elves and the Shoemaker is a well known Fairytale by the Brothers Grimm, about a poor shoemaker who receives some much needed help from some elves.You can't help but fall in love with the Shoemaker, as he is a charming old man, with a shock of off-white hair, big bushy eyebrows and fluffy moustache. He wears gold, round-rimmed glasses, has a hand-stitched nose and is made from a light cream, short-pile mohair. He is wearing light brown dungarees, a white shirt, brown sandals and his outfit wouldn't be complete without his apron and hammer, which is tucked into a pocket on the front, ready to be used to make his shoes - one of which is also included in this set.. He can stand freely and watch the elves, who are called BOOTLACE, RIBBONS and BUCKLE and they can also stand. They are made from light cream, short pile mohair and have long, fluffy mohair on their heads. They are dressed in beautiful elfin outfits, in delicate shades of green, blue and yellow and have pendants with little accessories that help them with their shoe making, such as a ruler and scissors.